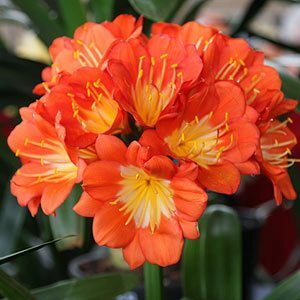 Clivia plants are a wonderful flowering plant with many cultivars available for sale both as both seedlings and larger plants, or perhaps try growing them from seed. They are a plant that can tolerate dry conditions once they have become established, species such as C. miniata can be regarded as a drought tolerant plant. These plants do not like to be planted in heavy soil, many growers use an aerated potting mixture such as perlite or composted pine bark mulch. Mature plants are readily available for sale online as bare rooted or potted plants. The Belgian hybrid, along with the cream , yellow and Kirstenbosch varieties are a few of the species that are rivalling orchids as the ‘must have’ house plant. 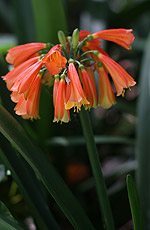 Remember that clivia do not like to be planted in heavy soil, many growers use an aerated potting mixture such as perlite or composted pine bark mulch. In the ground, again they need good drainage. Look out for for C. Robusta, a giant species. You can fertilise these plants in different ways and at different times of the year, although they require little fertiliser in good conditions. The best time to fertilise is before flowering, from spring through to summer, this is the time that you use a fertiliser that has a high potassium content (sulphate of potash) at this time to help promote better flowering. The second way to feed them is with a general purpose fertiliser, and you can do this if needed, two or three times from winter through to summer. In most cases if you have prepared the soil well, you will find that they will grow well with very little additional fertiliser. If your plants are not flowering then there a number of reasons. The first is that the plants are not mature enough. Generally they need to have around 12 leaves to be big enough to flower. Secondly, they need a cold period to bring them into flower. By cold we mean a temperature of around 10 C (50 F) over a period of 4 – 5 weeks. so if you are growing them indoors, they need to go outside over winter. Thirdly, they actually like to be kept dry over this cold period. So hold back on water, or keep them under cover in a cold position for this 4 – 5 weeks. Finally, Mealybugs that live in the soil can prevent flowering. You can simply repot the plant, removing all of the old potting mix and placing with a new mix and making sure that you was the pot thoroughly. You can try other remedies such as using coffee grounds as a spray. Chemical solutions are available, however we tend not to use those. These are a much hybridised plant, especially in Japan and South Africa, the ‘holly grail’ of breeders is to produce a white flowering plant. Lots of pale yellow clivia varieties but no real pure white flowering varieties yet. Previously known as “Swamp Gardenii” C. Robusta is the largest known species, flowers similar to that of gardenii and nobilis. As the previous name implies they can be grown in damp conditions . Flowers spring to summer. Tubular flowers with flower heads being smaller than those of C.miniata. A variety than withstands direct sun and heat more readily than other species. Leaves with a white strip, similar to c. nobilis with orange-red pendulous flowers. Nimbicola means ‘dweller in the mist’ so maybe this gives us a clue to its natural habitat. This species habit of flowering erratically throughout the year reflects on its parents C. miniata and C. caulescens. Flowers range from pastel orange to light pink.